Screenshots, trailers and other media of the game in action! Character and environment profiles, a who's who in the altered timeline of Nosgoth. Selected extracts from the game's Final Draft script to wet your appetite! The site is constructed around six large sections, navigated by the menu at the top of each page. Site Introduction - This section welcomes you to the site, with updates, legal tidbits, and a guestbook which you can sign if you like. Legacy of Turelzevir - An introduction to the four playable characters and their backgrounds, and what the Legacy of Turelzevir is all about. Nosgoth - When Kain and Raziel re-wrote Nosgoth's history and destiny, new environments and advesaries were brought into existence. Find out how to survive in New Nosgoth here. 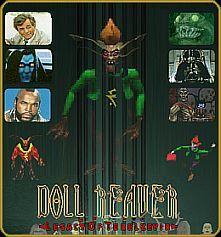 Downloads - Screenshots, Concept Art, Wallpaper, Packaging Art, and of course, the infamous Legacy of Turelzevir : Doll Reaver™ trailers! Scripts - The game isn't finished yet, but we understand how you gamers like tidbits of information. So, in this section we provide you with ten selected extracts from the game's final draft script. Be wary, there be spoilers in this here section. Internet Links - The 'net is abound with Legacy of Kain sites and communities (who undoubtedly will soon be renaming themselves 'Legacy of Turelzevir' sites to fit in with the franchise's new name). From fan pages to official sites, you can find the links here. This section also has links to the internet's large Legacy of Kain/Turelzevir communities.